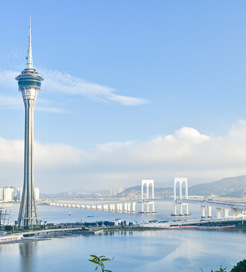 Macau is a small Special Administrative Region in the south-east corner of China, 65km west of Hong Kong. It’s rich in Portuguese colonial history and was the last Asian country to be relinquished from European rule in 1999. It’s because of this, the majority of Macanese architecture and place names resemble Mediterranean Europe. Colonial influence is most notable in the Ruins of St Paul’s, which comprises the stone facade of an early 17th Century Jesuit church. It was originally designed to help the illiterate inhabitants learn about Christianity but was burned down by a kitchen fire in 1835, leaving only what remains today. Climb the stairway and you’ll see intricate biblical carvings and statues of Virgin Mary. Ride a cable car to the Guia Fort and chapel at the top of the Peninsula and you’ll be rewarded with sublime panoramic views over the city. The structures were built in the 1600s after an unsuccessful assault by the Netherlands and they retain most of their original features. Macau is synonymous with gambling. It was legalised in the 1850s and makes up 50% of the economy, creating a larger revenue than the Las Vegas Strip. Try your luck in the world-renowned Lisboa and Sands Casinos, if not to play, then to appreciate their sheer size and magnificence. There are a number of upmarket restaurants in the Peninsula to suit any taste. You can enjoy some popular Portuguese dishes such as potato and chorizo soup, salted cod and egg tarts. Or you can sample some local Macanese food, which infuses both Cantonese and Portuguese dishes. The local favourites include pork chop buns and minced meat with fried potato and rice. There are frequent, high-speed ferries departing from the Port of Hong Kong, Kowloon and Hong Kong Airport, which all last around one hour. From mainland China, you can sail from Guangzhou, the Port of Shenzhen and Shenzhen Airport. These journeys are also run very frequently, making it even easier to enjoy Macau, ‘The Monte Carlo of the Orient’. For more information, please visit our Ferries from Hong Kong to Macau page. For more information, please visit our Ferries from China to Macau page.